Closed Loop Extraction Tips - California Trim Store Worlds best bud trimmers. What is Closed Loop Extraction? A "closed loop" refers to a system in which the entire process is done within a "closed" vessel. The solvent used to extract does not ever come in contact with the outside atmosphere. The "loop" portion refers to the recovery and reuse aspect of the system. The solvent will start inside one vessel, and then move through another containing botanical material, after which it will return back into the original vessel hence creating a "loop". Closed loop extraction is a fast, efficient way to remove essentials oils from botanical material and, when operated properly, is extremely safe. A solvent is a substance which is able to dissolve and absorb other substances when it comes in contact with them. There are many different types of solvents, some of those are; butane, propane, iso-butane, pentane, hexane, ethanol, isopropyl alcohol, acetone, benzene, chloroform, methanol, and even water. These are just a few of the many solvents found throughout the chemical world. Many solvents are carcinogenic or extremely flammable, which means proper safety procedures should be observed at all times. When performing a closed loop extraction, the most common types of solvents used are hydrocarbons. These compounds consist entirely of hydrogen and carbon molecules. Many of these hydrocarbons occur naturally on Earth in crude oil. The production of these hydrocarbons are done in large petroleum factories around the world where the hydrocarbons are separated and used as a combustible fuel sources, aerosol sprays, and solvents. So how does a closed loop actually work? Your solvent tank will contain your desired solvent. In this example we will use butane as our solvent. Your material column will contain your desired material. For this example we will say it is 1lb of freshly trimmed indoor grown Girl Scout Cookies (one of my personal favorite strains). The first step to remove the oil from our material is to input our butane solvent. We will open our solvent tank and allow butane to begin flooding our material column. As the butane makes contact with our material, the essential oils will begin to dissolve into the butane. As our solvent works its way through the material, the essential oils continue to be dissolved, leaving us with a butane/oil mixture. Once the butane/oil mixture falls into the collection base, we must now separate the two. To do this, we must evaporate the butane. Since this is a "closed loop" we will also need to recollect the evaporated butane back into our solvent tank. 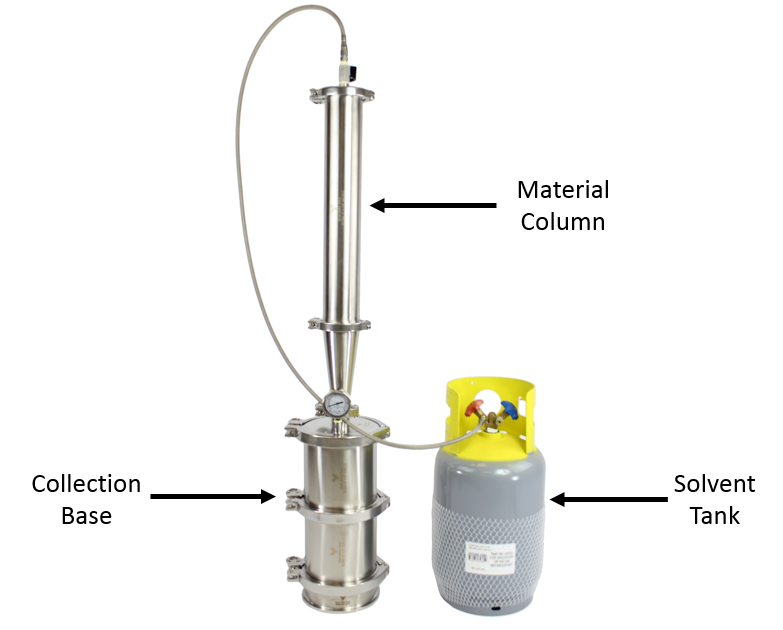 This is done by placing the collection base in warm water, and placing the solvent tank in dry ice or ice water. This will create a temperature differential. The butane will begin to evaporate and escape the collection base, which will be pulled into the solvent tank by this temperature differential. Butane vapor is attracted to the cold solvent tank so, the colder you can make the solvent tank, the faster and more efficiently the butane will be recovered. Inside the solvent tank, the vapor butane will re-condense into low pressure liquid. Once all butane has been evaporated from the collection base, all that will be left over is the oil we extracted from the Girl Scout Cookies. Our solvent tank will be filled with butane which we can reuse and the "loop" will be completed.